I recently had the opportunity to review Claritin RediTabs through BZZAgent. I purchased the Claritin RediTabs, 10ct, 24 Hour with my free coupon. With Claritin RediTabs there is no water needed. They melt in your mouth! It had a weird peppermint taste to it but it wasn't bad. Just weird in the fact that it was kind of hard to explain. The pill dissolved almost instantly and didn't leave a nasty after taste which was good. I suffer from seasonal allergies so the Claritin campaign was a good fit for me. I sometimes sneeze for what seems like hours. I dissolved the first pill about three days ago and I can definitely tell a difference in my sneezing, itchy, watery eyes, and runny nose. 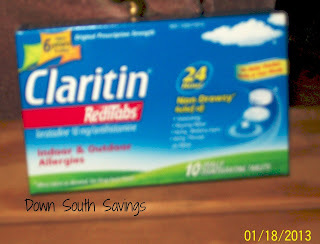 Highly Recommend Claritin to any of you that suffer from indoor or outdoor allergy symptoms! Disclosure: I received the above mentioned product free of charge for review purposes only. No other monetary compensation was made. My opinions are that of my own and my differ from those of your own.